The first cuckoo clock dates back to around 1730, they were an improvement on roughly one hundred years of clockmaking progress. 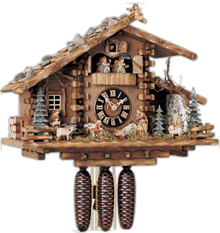 The original cuckoo clocks were made in the Black Forest of Germany, where people were often cooped up for the entire winter. It was during those long cold, drawn out months of winter that they manufactured their wonderful clocks. Then in the summer months they made a good living by peddling their clocks to clock carriers, (Uhrschleppers in German), who took the clocks all over Europe to re-sell. Over time, cuckoo clocks became more sophisticated with the adoption of new ideas, tools, and skills. People also began to specialize in certain aspects of clock making, such as carvers and case makers. But the cuckoo did not sing until Franz Anton Ketterer, a clock-master from Schonwald, designed a system of small bellows and whistles to imitate the cuckoo’s call in 1738, utilizing the same technology used for church organs. Many older cuckoo clocks that have been well cared for, still exist today. The cuckoo clock can be distinguished from any other timepiece in a number of ways. Just like a grandfather clock, the cuckoo has a particular shape that readily identifies it. It is a wall clock that has two or three weights to drive time, the hour, and possibly a melody. The clock case is generally dark brown and in the shape of a chalet style house with a peaked roof that is decorated with a carved large bird or other animal. The distinguishing element, the cuckoo bird, pops out of an aperture in the peak of the chalet to announce the hour and the half hour. Cuckoo clocks originated in the southern part of Germany known as the Black Forest region. The first cuckoo clocks were entirely made out of wood, including the internal plates and gears. As time passed, the inner workings and decoration of the clocks became more sophisticated and ornate. The birds wings and beaks became animated, and some were even decorated with feathers. The inner workings of the clocks were improved with the introduction of metal gears and metal plates. Decorative family scenes, hunting and military motifs gained in popularity. In the late 1800’s, the cuckoo clock industry became more industrialised. Cuckoo clock manufacturing spread across Germany and various other countries in Europe and although it was still partially a cottage industry, with work being done in people’s homes and barns, there were also a growing number of factories. The work was split between the decorators and the masters of the inner workings, with technological advances in each area offering increasingly complicated and ornate clocks. By the middle of the 19th century, two principal forms of the cuckoo clock had emerged. The railway house form is the kind most often seen today. In the relatively small village of Triberg, it is estimated that by 1850 there were some 13,500 people engaged in some part of the manufacture of cuckoo clocks, working for over 600 different manufacturers, and all because Mr. Ketterer managed to duplicate the sound of a cuckoo bird. The casing of a modern cuckoo clock is conventionally shaped in the form of a rustic birdhouse or quaint chalet from Switzerland or Germany. Most typical decorative elements are wine leaves, animals, woodland plants, and hunting scenes with the modern addition of beer drinking. Themes have developed, such as the Hunters Clocks which feature guns, powder horns, ammunition, and game animals decorating the clock, represented as either alive or dead. Some are ornamented with animated scenes characteristic of the traditional Black Forest, such as dancing couples in traditional dress moving to music, a rotating mill wheel, or a farmer chopping wood. Antique Cuckoo Clocks … should not be confused with modern day cuckoo clocks that are still made in a variety of countries and can still be bought in clock shops around the world.